After eloping with her lover and being deserted by him, Maria is believed dead but returns home to discover her father has died and left everything to her cousin Matilde. Maria’s ex-lover stabs her and again Maria is believed dead, but in the gripping final scene – a gift for a soprano – Maria stabs Matilde and then confronts Corrado, telling him in her dying moments that she still loves him. 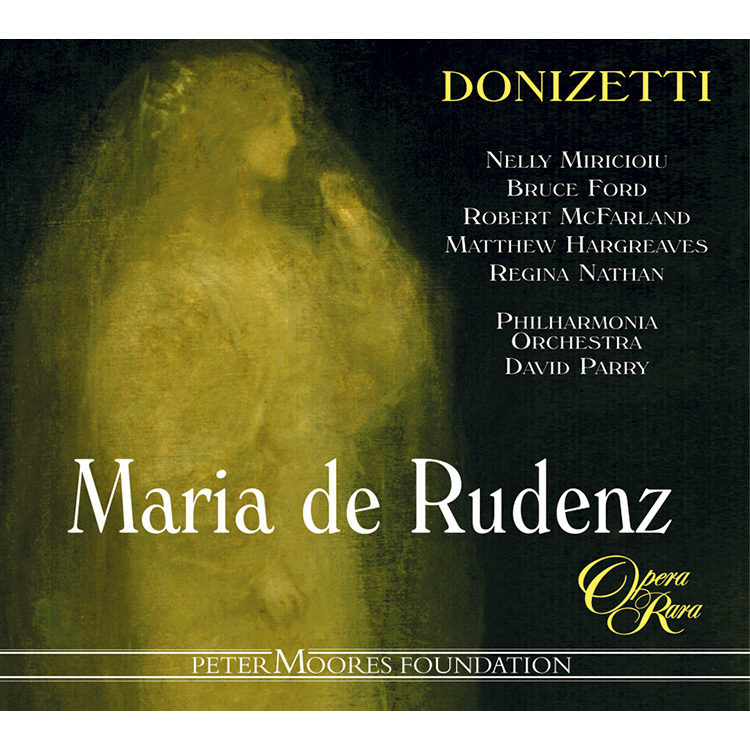 Cammarano’s horrific libretto is given some of Donizetti’s most beautiful music. After eloping with her lover and being deserted by him, Maria is believed dead but returns home to discover her father has died and left everything to her cousin Matilde. Maria’s ex-lover stabs her and again Maria is believed dead, but in the gripping final scene – a gift for a soprano – Maria stabs Matilde and then confronts Corrado, telling him in her dying moments that she still loves him. This scene alone was enough to ensure many productions throughout Italy and Europe in Donizetti’s lifetime and beyond. 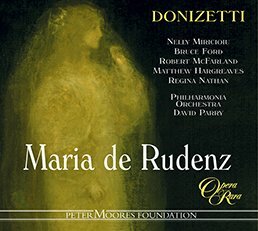 03 Maria de Rudenz: Part I: scena III: Duetto: Fratello! ?Enrico! ? 10 Maria de Rudenz: Part I: scena VI: Finale primo: Matilde ? – scena VII: Empio, cessa ? 14 Maria de Rudenz: Part II: scena I: Aria: Ebben, colei? ? 16 Maria de Rudenz: Part II: scena II: Aria: Al nouva di? Ah! ? 19 Maria de Rudenz: Part II: scena III: Duetto finale: E d’altra il cor ? Ne franger – scena IV: Oh ciel! ? 21 Maria de Rudenz: Part III: scena II: Duetto: Tardi, ah! Tardi guingesti! ? – scena III: Arresta! 23 Maria de Rudenz: Part III: scena IV: Duetto: Vengo ? si. 26 Maria de Rudenz: Part III: scena VII: Aria finale: Mostro iniquo, tremar tu dovevi – Final scena: Quai gridi son questi! 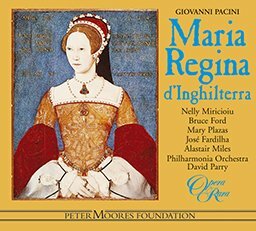 29 Maria de Rudenz: Appendix: Part I: scena VII: Scena e cavatina con coro: Che pensi Enrico? Scene 1. It is early morning in an inn on the banks of the River Aar. Through the windows can be seen part of the Convent of Arau, and, on the other side of the river, the castle of Rudenz. Matilde and the nuns of the convent are heard at their morning prayers. Corrado awaits the arrival of his brother Enrico, impatient since he is eager to join Matilde at the castle. When Enrico appears, the two brothers greet each other warmly. 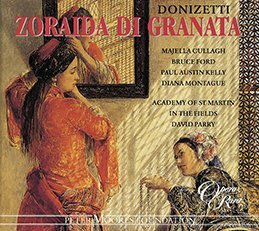 In answer to Enrico’s enquiry, Corrado confirms that he has deserted Maria, the daughter of the last, recently deceased, Count of Rudenz. He tells how, after eloping with her to Venice, he had come to believe her faithless, so had taken her to Rome and abandoned her during a visit to the catacombs. His initial intention had been that she should perish, lost in the labyrinth of subterranean passages, but he had subsequently relented and sent a guide to rescue her. Since then he has been wandering from country to country, ever changing his name to prevent her from tracing him. Now, however, this wretched and fugitive existence has been replaced by a new happiness, for he has fallen in love with an orphaned heiress, Maria’s cousin Matilde di Wolff. He has wooed her, without revealing his true identity or past history, and they are about to be married. Enrico, as soon as he hears Matilde’s name is consumed by jealousy, for he too, it seems is desperately in love with her. Corrado explains that the Count of Rudenz, in his last testament, decreed that, should Maria not reappear with a year, his estate should go to Matilde, who, instead of entering a convent, should be free to choose a husband. The year has now passed. In eager anticipation of his approaching happiness, Corrado urges Enrico to accompany him to the castle. Scene 2. In the castle. Rambaldo, an elderly retainer of the house of Rudenz, is surprised to find a woman weeping before the portrait of his late master. It is Maria, who has found her way here by a secret underground passage. Rambaldo tells her of Matilde’s imminent inheritance and choice of a husband, and Maria initially – for at this stage she is unaware of the identity of the intended husband – wishes her cousin well: she herself has no further worldly ambitions, for she intends to take the veil and enter the convent of Arau. As Maria withdraws, the retainers of the household gather to greet Matilde. But their mood is one of mourning for Maria, whom they believe dead – not joy at the prospect of bending the knee before a new master, Matilde’s future bridegroom. Matilde enters and presents Corrado as her chosen husband and their new lord. The testament of the Count of Rudenz is read, and Corrado is in the middle of swearing his love and undying fidelity when, summoned by Rambaldo, Maria appears. A major confrontation ensues, during which Maria succeeds in separating Corrado and Matilde. The retainers declare their allegiance to Maria, rather than to Matilde and Corrado, and Corrado is forcibly ejected. Enrico returns to the castle to plead with Maria to show leniency towards Matilde. He remarks that, by keeping her cousin a prisoner and forcing her to take the veil, she may be pretending to fulfil her father’s wishes, but really she is perverting them to her own ends. Never, he declares, will Matilde enter a convent: he himself will prevent it, for he, too loves her. Maria’s reaction is to reveal that she has information that will enable him, rather than Corrado, to become Matilde’s husband – but before divulging it, she insists that she must see Corrado once more. This interview – this confrontation – promptly ensues. Maria informs corrado that she intends that Matilde should marry Enrico. Corrado is incredulous and protests that Enrico, his own brother, would never be his rival. But Maria proceeds to disillusion him: Enrico is indeed the true son of their father, but she has proofs that Corrado was taken in as a foundling when his own father, a notorious criminal called Ugo di Berna, who has since been ignominiously put to death on the scaffold, fled the country. Corrado is shattered. Maria, taking advantage of his humiliation, pleads her own cause: if Corrado will give her back his love, she will willingly destroy the proofs of his birth. But although he can find it in his heart to pity her, Corrado is unable to love her. Her wish for revenge now begins to gain the upper hand. By pressing a secret spring, she makes the stones that form the threshold of Matilde’s room sink out of sight, leaving a gaping pit. She has only to call Matilde, and Corrado will see his hoped-for bride fall to her death as she answers the summons. She will be spared only if Corrado renounces her and instead swears eternal fidelity to Maria. As she beings to call, Corrado, driven to desperation, draws his dagger and plunges it in her breast. She falls, apparently fatally wounded. Rambaldo and the retainers come running. But Maria declares Corrado’s innocence, claiming that she stabbed herself. Scene 1. An atrium, adjoining the castle chapel where the marriage of Corrado and Matilde is being celebrated. All the retainers are in a state of consternation and dismay, for they regard this match as guilty and ill-omened. Their disquietude is increased by the fact that the ghost of Maria, swathed in a dark mantle and with streaming hair, has been seen hovering near the bridal chamber. Enrico arrives, breathless and dust-covered, but Rambaldo tells him that he comes too late: by this time the marriage vows will have been exchanged. At this moment, indeed, the wedding procession returns and mounts a staircase to the apartments where the wedding banquet is to be held. Enrico waylays Corrado. He taunts him with his shameful birth, and challenges him, vowing that he will never allow him to enjoy Matilde’s love. Corrado, who still feels a brotherly affection for Enrico, tries to avoid a quarrel, but Enrico tears the insignia of the Counts of Rudenz from his chest and tramples them underfoot. Provoked beyond endurance, Corrado accepts the challenge, and the two depart to fight a duel together. While the wedding guests celebrate the marriage of the as-yet-absent Corrado and an apprehensive Matilde, a masked female figure furtively crosses the stage and enters the nuptial chamber. In due course Matilde retires, attended by her ladies. Corrado returns, conscience-stricken since he has killed Enrico, and wishing only to forget what he has done in Matilde’s embraces. But at this moment a suffocated scream comes from the bridal chamber. Corrado hastens to investigate, but before he can cross the threshold he is confronted by what he takes to be the ghost of Maria. But Maria is very much alive. She throws open the chamber door and bids him enter. He returns ashy pale, for he has found Matilde murdered. He rounds on Maria and goes to draw his sword, only to find that he is unarmed. But, as Maria tells him, he has no need to slay her: she is dying already, for her unhealed stab-wound has reopened. Even as she reproaches him, she continues to declare her unquenchable love, and at last he begins to appreciate the immensity of the love that has driven her to such frightful lengths. Filled with remorse, he goes to embrace her, declaring that it is his punishment to have to continue to live. But even in this last act of remorse and contrition he is thwarted, for Maria tears the bandages from her wound and falls dead at his feet.